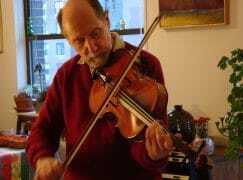 The Guarneri Quartet violinist Arnold Steinhardt has written a beautiful reflection on his friend and colleague Michael Tree, who died five months ago. In all the forty-five years that our Guarneri String Quartet performed in public, and during the nine years since we retired, I don’t believe I’ve dreamt of the quartet more than a handful of times. This might seem odd to string quartet aficionados who know how much must go into a performance: practice and more practice, discussion and disagreements, endless and often exhausting travel, and, finally the high bar we set for ourselves in performance itself. Lots to dream about, wouldn’t you think? I wonder myself why I haven’t dreamt more often about our quartet. Perhaps it has to do with the nature of who the members of our group are and how we operate with one another. We are a rowdy bunch—like four opinionated brothers you might say—who, while maintaining a certain amount of respect and politeness in rehearsal, have no qualms about truth telling. A most unprofessional explanation of my Guarneri-less sleep might be that our openness and frank criticism during rehearsals—for the good of the performance rather than to squabble with each other on a personal level—meant that each of us walked out of rehearsals relatively unencumbered by smoldering resentments or unresolved issues. And therefore presumably nothing of substance to dream about. What a beautiful remembrance. Thank you for it. Arnold Steinhardt writes an essay almost every month. They go back to 2007 (maybe earlier). My copy of ‘The Art of String Quartet Playing’ by the Guarneri Quartet with David Blum is still a go-to performance and teamwork bible for me. But also the four characters speak out of it so strongly, and I had always ‘known’ Michael as quite a wag and lots of fun, and this helped disabuse me of the notion that string quartet players are stuffy serious types. I actually cried as I read Arnold Steinhardt’s beautiful and touching tribute to his friend and colleague! It brought back wonderful memories of the quartet and I couldn’t help feeling personally that Michael was the heart of this unique group. That rich chocolate viola sound and vital musical personality coming right out of the middle were unforgettable. It was so exciting and enriching to be around the Guarneri as they filled Wigmore and Elizabeth Halls just three years after their formation, as I worked at that time for their management in London. Michael with those sparkling mischievous eyes full of fun and jokes with his newly wed beautiful Jani by his side. Thank you Arnold for those vivid memories of such a great musician and life-enhancer!